The Liar : It takes one to catch one. A MISSING GIRL. A DESPERATE FATHER. A CASE WHICH WILL TEAR THEM APART. Leonard Howell's worst nightmare has come true: his daughter Caroline has been kidnapped. He can't rely on the cops, so Howell calls the only man he trusts to get her back. Eddie Flynn knows what it's like to lose a daughter and vows to bring Caroline home safe. Once a con artist, now a hotshot criminal attorney, Flynn is no stranger to the shady New York underworld. ... OR THE ONE WHO BELIEVES A LIE? However, as he steps back into his old life, Flynn realizes that the rules of the game have changed - and that he is being played. But who is pulling the strings? And is anyone in this twisted case telling the truth...? 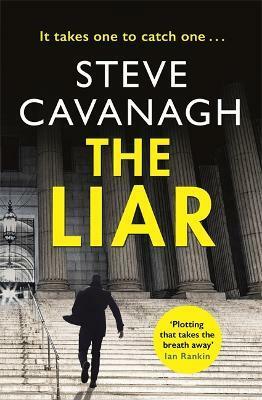 Steve Cavanagh was born and raised in Belfast before leaving for Dublin at the age of eighteen to study Law. He currently practices civil rights law and has been involved in several high profile cases; in 2010 he represented a factory worker who suffered racial abuse in the workplace and won the largest award of damages for race discrimination in Northern Ireland legal history. He holds a certificate in Advanced Advocacy and lectures on various legal subjects (but really he just likes to tell jokes). He is married with two young children.